We have added a completely free plan to GageList. It only includes 1 user and has a smaller storage capability, but it includes all of GageList's great features except attachments due to the small storage size of the account. Features added to allow attachments in both Calibration and Equipment Attachments may be used to store scanned 3rd party calibration certificates, manufacture documentation, etc. Fixed bug causing negative taxes and totals when some discount codes were used. Improvements have been made to simplify the new user login process. The User Guide revised to reflect new process and is available in the Support area. 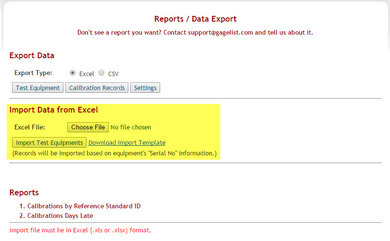 A new GageList® Users Guide is now available on the Support page. This helpful guide shows how to manage and calibrate your gauges and equipment using GageList.